Dolphins Got A Ticket To Ride, But At What Cost? Traveling by air with your pet isn't always the easiest task. Back in 2009 when the pet-only airline Pet Airways took to the friendly skies, dog-owners… hell, even pig owners… were content in the fact that their pets were finally given safe passage and no longer treated as inanimate 'cargo.' But in two short years, with reports of delays, cancellations and stranding dogs and cats, the airline has had difficulty in generating a positive cash flow, and folks are in need of seeking other options. So, where does that leave the dolphins who might have a need to hopscotch across the globe? To answer that query, you might want to ask the question why anyone would want to transport live dolphins by air to begin with. 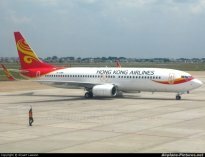 Well, apparently the town of Taiji in Japan and Hong Kong Airlines are seeing it as lucrative commercial enterprise. 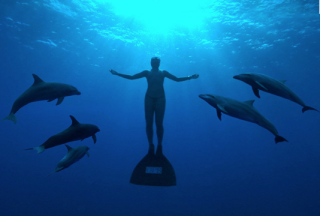 In the film, there in an isolated cove surrounded by wire and warning signs, fisherman use sonar to confuse and trap dolphins by the thousands. After restraining them, some sold into the lucrative aquarium trade, while the rest have been slaughtered and sold fraudulently as whale meat in the Japanese market. While each dead dolphin sells for about US$600, those captured alive are worth as much as US$200,000 when sold to aquariums and swim-with-dolphins parks around the world. 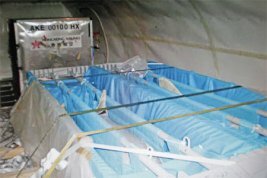 In a recent flight from Osaka, Japan to Hanoi in Vietnam on February 29, 2012, 5 dolphins were transported as cargo in what several have described as "living coffins." They spent at least 7 hours in this cruel captivity at the pricey fare of HK$850,000. Heavily sedated, the animals had no room to maneuver, and while flying in general is "tough on human ears - it must be agony for creatures such as dolphins who navigate an communicate by sophisticated sonar," noted Simon Parry in the Hong Kong edition of China Daily. According to this report, animal welfare groups believe that the destination for these dolphins is most likely Vietnamese theme parks that stage sea life performances. According to Parry, "theme parks pay up to $150,000 per animal exclusive of transportation fees to import highly intelligent bottlenose dolphins." Janet WalkerJanet Walker, head of Hong Kong Dolphinwatch, said she was shocked by the Hong Kong Airline memo: "They should be ashamed of themselves, crowing about how much money they've made out of the sheer misery they've put these dolphins through." For those that want to become involved in the thwarting this type of activity in the future, Change.org has an ongoing petition to sign and updated information as additional incidents like this are uncovered. Additionally, there is a social media campaign on Facebook to end the slaughter and captivity of marine animals in Taiji. Please go to: https://www.facebook.com/Savemistythedolphin for more details. And readers, do let us know if you are aware of any other cruelties endured by one of the Earth's most beloved species?